Ripple Effects develops, supports and continually tests an integrated set of technology-oriented products to reduce injury, increase academic success, and strengthen pro-social behavior among children and the adults who work with them. A evidence-based, reading-independent tool, Ripple Effects for Teens includes 390 reading independent tutorials? that provide individualized guidance that zeroes in on the particular risk and protective factors that affect student behavior, motivation, learning and connectedness. It provides cognitive-behavioral training to turn students around. While recognizing risks, the program focuses on building strengths, especially in core social-emotional abilities that are correlated with academic achievement and resilience. From truancy to vandalism, sexual harassment to violence and bullying, you can simply assign students time on that topic and check the easy-to-use management system to make sure they’ve completed the necessary tutorials. Interactive games and exercises help them understand the reasons behind their actions and learn proven effective strategies for changing their behavior. Tested with NIH funding, Ripple Effects for Teens has been shown to reduce risk, enhance protective factors, improve behavior and raise grades for Black, Latino and Caucasian students from traditional, alternative, charter and continuation schools in rural and urban settings. There are many right ways to use it - for systematic training, for targeted intervention, or for individualized guidance. It can be applied reactively, to deal with specific issues in a few minutes, and proactively, over time, to boost academic achievement, change behavior, reduce substance use, and promote healthy choices. It’s designed to be used how you need it, when you need it – throughout the school and in the community.It's driven by Ripple Effects' Whole Spectrum Learning System, a groundbreaking approach that is responsive to the varying needs and abilities of a wide range of users and learning styles. 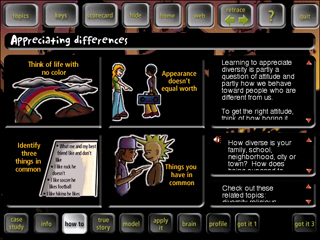 It offers no fewer than eight modes of learning for every topic in the program. A full topic takes about 15 minutes to complete. Educators can also track student progress, and block topics they feel aren't appropriate. Try it: order a risk-free 30 day preview of the full program. Because each program has so much content, especially audio and video, each needs a lot of storage memory on your computer hard drive. That's likely to be the toughest requirement to meet. All products work on Macintosh and PC computers. Note: There is an option to set up the program if you have only 32 MB of free hard drive space, but we don't recommend it: it makes playback very difficult. Only do this if you are previewing the program in advance of making an investment in a bigger hard drive! DO NOT try to use it this way with students. Modem speed of at least 28.8 Kbytes/second. 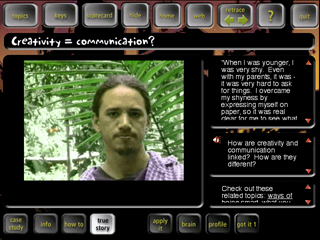 Ripple Effects for Teens offers over 390 tutorials. 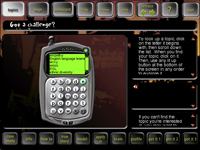 They are accessed in two ways: through pre-programmed units on Strengths, Problems, and Reasons via the "Keys" screen at right; or via anA to Z index, displayed in a mock cell phone. Below is a list of the topics by unit. You can also download the topic list by unit or the alphabetized topic list. 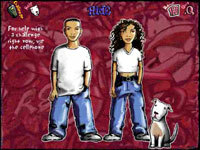 From here you can view an online demo of Ripple Effects for Teens. One topic, "predicting consequences," will have the audio and interactive parts, but not the "true story" and "movie model" videos you get in the full program. Before you launch it, make sure you have what you need for it to work: a fast Internet connection (DSL or faster), and a particular kind of software, Adobe Flash Player. Also, turn up your speakers so you'll hear the sound. If you have a slower connection, try it at your own risk - it'll be painfully SLOW. A better option is to e-mail us a request for the CD-based demo. For the online demo, you can download Adobe Flash Player by clicking here.It takes a few minutes to download and get it working. Once it's done, use your browser back button to return to this page and view the demo. To launch the online demo click here. "This program is wonderful - I can't rave about it too much. Every single time they use it, kids get caught up in it. By working through the program and talking with me, I'm seeing kids solve their problems, and turn themselves around."